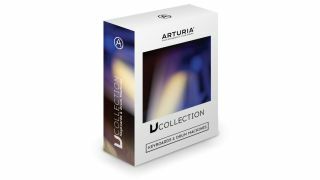 Arturia has released version 4 of its V Collection bundle, which contains all of the company's software instruments. There are four additions in this version, two of which are completely new. There's the Matrix 12 V, which emulates the Oberheim Matrix-12 polysynth, and the Solina V, a virtual version of the Solina String Ensemble string machine from the '70s. Also included are the existing Vox Continental V organ and the Spark 2 suite of drum machines. Registration and copy protection are now handled by the Arturia Software Centre (ASC), which also comes included. For your convenience, the boxed collection ships on a USB flash drive rather than a stack of DVDs (there's also a download option). You can find out more about the V Collection 4 on the Arturia website. It's available now priced at €399/$399.